I haven't done one of these in a while! In the many months that I've been doing Adored Austin, I've been introduced to hundreds of amazing self-style blogs. My bookmarks are out of control, but I wouldn't have it any other way! "Little Tin Soldier is a homage to my favorite fairy tale, "The Steadfast Tin Soldier" by Hans Christian Andersen. The story chronicles the life of a little tin soldier who falls in love with a paper doll. Unfortunately, he is thrown from a window but eventually ends up back at his house. But then one of the boys flings him into the fireplace. The paper doll blows into the fire, too. He melts into the shape of a heart. I started the blog in January 2010 as a way to encourage myself to draw one picture everyday. As a little girl, I loved paper dolls. I thought it would be fun to feature a paper doll alongside my daily outfits." I love it. 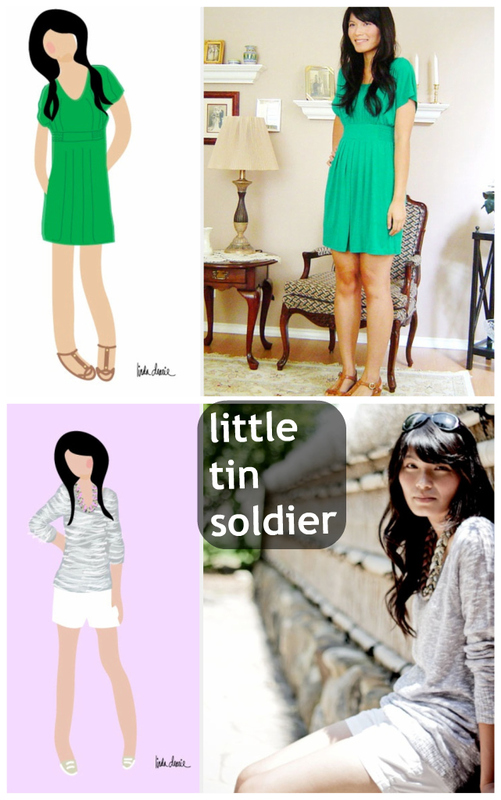 If you're on Tumblr, make sure to follow Little Tin Soldier. If you're not, add it to your ever growing list of bookmarks!